Now you know that I rarely watch live TV (like animals) but we've had an issue with our local Fox HD channel cutting in and out. The AI results show where Jason went home didn't record because of a blip at the beginning. Since then, I've had the DVR set to record the "regular def" channel and we watch it live on HD. That way, if the blips occur during a crucial moment of David Cook's song, I can re-watch it on the recording. And so it went this week. On Tuesday night I was all settled in to watch the show while cutting ribbon for some class kits, but John was in the kitchen making too much noise loading the dishwasher. ME: Yeah, that's not working for me. Put the dishes down and come sit by me so we can have some together-time watching the man I'm going to leave you for. JOHN: I just can't get over his giant head. ME: Hey! That's unfair. He's very tall and his head matches his body. It's proportional! JOHN: Look at him there next to Ryan. Their heads are two completely different sizes! ME: You may have a point. When I have his baby it's probably going to hurt a lot . . .
John just rolled his eyes. He can act nonchalant, but I know that he, too, was pleased that David Cook won Idol last night. I distinctly remember turning and seeing a smile on his face just before I jumped off the couch and yelled "Yes!" and pumped my fist in the air and ran around like a wee giddy widdle school girl. Brooke was really, really good with Graham Nash, no? I was nervous at first and said "Don't start over! Don't forget the words! Don't start over!" but she didn't, and I approved. But the best . . . the very best . . .the reason I may have to retract my disdain for live-TV viewing . . . the Guitar Hero commercials!!! So congratulations, David Cook. (I'm sure he's reading this) I will be counting the days till your CD comes out. Molten lava hot for me, dawg. But let's return to the subject of the dishwasher . . . (segues, so good at the segues) I had another couch-convo with John about a week ago. ME: Oh say! I forgot to mention that I've come up with a more efficient way to load the dishwasher! ME: Well, there are four sections of the silverware basket besides the center one for knives. So what I do is load the first section with big forks, the second section with small forks, the third section with big spoons, and the final section with small spoons. When you go to unload it, you just grab the entire bundle and put it in the appropriate section of the silverware drawer. It's a totally brilliant plan! JOHN: I'm not on board. ME: (flabbergasted) What do you mean 'I'm not on board'?! It makes unloading totally quick and easy - you don't have to sort the silverware!!!! JOHN: Sure you do. You have to sort it when you load it. Did you also come up with a brilliant new way to clean out the lint trap on the dryer? Whatevs. I still think I'm right. So I'm pretty darn busy trying to get things ready for Europe and I haven't been exactly thorough with my e-mails. If you've e-mailed me about something and I didn't respond - please re-send the e-mail with perhaps a note that says "How about answering me this time, asshat?!" Or something. I have a couple of plugs to make. Speaking of writing . 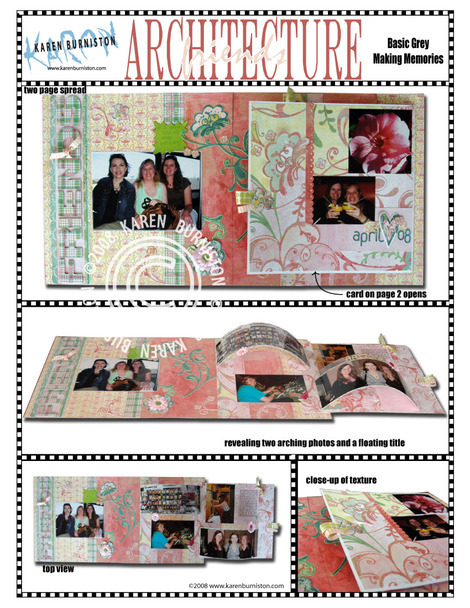 . . in the form of journaling, which we should all be doing on our scrapbook pages before we call them "done" . . . (yes, I'm looking at you Sandy!) 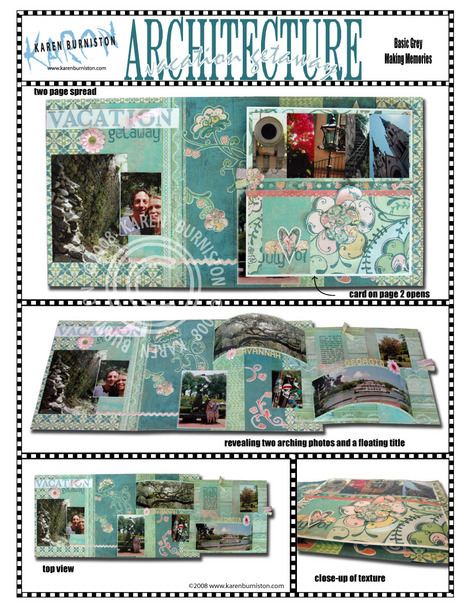 - check out this blog with journaling challenges: Journaling Junkie You can see how the design team interpreted each week's challenge, and I believe you can even win prizes if you enter your take on the challenge. Cool site, Stella! RKQOTD (Me: Emma, you need to do your math worksheet. Emma: suspicious pause Actually, I did 2 worksheets yesterday, so I'm all caught up. Me: Oh, OK. I'll just take a look at those two completed worksheets then. Emma: squirming Uh . . well actually . . . you know . . . I think I'll just go to my room and do tomorrow's worksheet now . . . Me: Good idea! Get it all done early. I'll just take a look at those two completed worksheets now. Emma: But, uh, I think I'll just bring them all down later. Me: Did you finish 2 worksheets, Emma? Emma: hanging head No. Me: Did you finish ONE worksheet, Emma? Emma: visibly nervous No. Me: So you LIED about having your homework done? Emma: yes. Me: You have been warned before about lying. You are now grounded from both TV and the computer until Gram gets here on Monday. Don't even THINK about turning on the TV or computer until then! Emma: perkily OK! That will give me a chance to catch up on my reading! As promised, here's the other clear album class. This one is for Akkefietje on June 5th in Eindhoven. I believe there is still space available. It's hard to really do this project justice with flat photography, so let me explain why it's so cool. I think of a spiral as an SPT. (Standard Pop-up Technique) If you're into pop-ups at all, you've probably done a spiral. It's quick, it's easy, and it gives a "wow" factor. Usually you make the spiral from double-sided paper or a transparency. The pattern is irrelevant because even though the spiral returns to a flat position when the card is closed, you never see it in that position because the card is closed. You dig? The card hides the circle and as soon as you open the card, the circle spirals out and you can't see what's on it anymore. Unless you're using a clear album! I've had this idea swimming in my head for a couple of months now and finally got the chance to make something with it. A spiral in a clear album is cool because you can see it flat! Which means you can make it out of a photo, or cool patterned paper, or both, and at some point you will see the spiral in it's flat position. All of the products on this project are Rusty Pickle. The collection is called "Lucky" and this album can work in any theme, not just travel. HOWEVER! If you're making this album about a person or people, they can be in all the pictures EXCEPT the ones that are cut into spirals. Those photos need to be scenery or objects. If you cut through a person's eyes it looks weird, so I do not recommend people photos for the spirals. Now normally you don't have to bring photos to my classes, but for this class, you do. I'm making it easy for you, though, with this PDF file that will help you size and crop your photos. If you make sure that page scaling is set to "None" in the Print Dialog Box, the resulting print-out will be actual-size. Verify that it printed full-size by measuring one of the boxes. This is going to be a fun class! I'm excited! So here's the first of two new clear album classes. This is NOT the class for Akkefietje on June 5th. This is the class for Chepstow, England on June 12th. We have less time in Chepstow, so I needed something that would go together quickly, but still be uber cool and nifty. This album will also look cool with color photos and I will make a color version sample too. In that case, you might also use markers or pencils to color in some of the doodles on the patterned papers to add more pops of color. I'll be posting my color version after I get the other acrylic album class done. The paper collection is called Pop Star, by Rusty Pickle, and the kit includes the entire package of alphabet stickers, so you can use whatever theme/title you want. Glue dots or tacky tape - something strong! 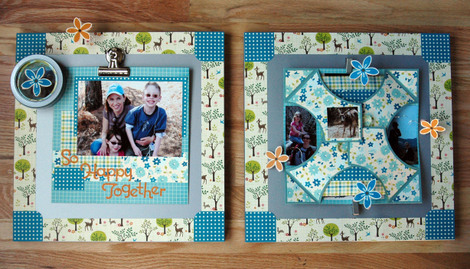 To add color, bring color photos and some colored pencils or markers. The doodly nature of the papers lend themselves well to adding color! All photos are 2" (5cm) round photos. 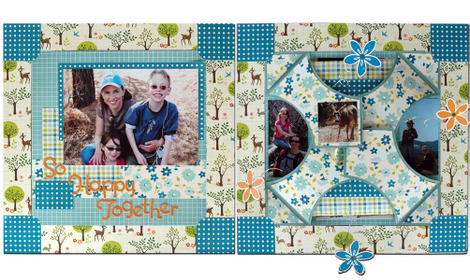 Album can hold up to 10 family members by utilizing the space on page 6. Or use pictures of just the kids, or pets, or cousins, or just one person, or your flower garden – it's up to you! One last thing - if you own an old fashioned manual eyelet setter - the one that's metal and needs a hammer - bring it. Don't bring something fancy and spring-loaded, and don't just assume that you can use your Crop-a-Dile to set the eyelets, because you CAN'T! I will not allow it!! But I will share my hammer and eyelet setter, so don't go shopping or anything. And now I'm being summoned to watch Lost. A newspaper? A sunburnt nun? A blushing zebra? This is a class that will debut in Holland, at Akkefietje on June 5th. I will also teach it in England at Chepstow on June 12th. The collection is Heidi Grace's Midnight Kisses, which was one of my favorites from winter CHA. It's hard to really show the beauty of these papers with photographs, but some of the papers have a shimmer glitter to them, with raised epoxy-ish designs, and the shiny CD frames work perfectly with them. The layout can be operated in page protectors - we'll just cut them. The theme on this one does not have to be girl. The kit includes the entire chipboard alphabet, which comes with numbers and some little hearts, so you can title it whatever you want. The collection is floral, but the red/white/black color scheme has a more sophisticated (even manly) theme than usual florals, so I think this could be used for anything. General Adhesive (student's choice) - I love tape runners because they're quick, but bring what you like. Glue dots or Tacky Tape - you'll need something strong to attach the CD's since they're twisting and moving. Black inkpad (optional) - If you're a lover of the inked edge look, definitely bring your favorite ink pad! "Mom, I really am a mixture of you and Dad, because I look more like Dad, but I act more like you. I like reading. I like Nancy Drew . . ."
". . .You have brown eyes. You watch too much TV. You're kind of messy. . ."
"Yeah – neither of us clean our rooms!" "We're the same, you and me!" I smiled then. It was nice to think about the things we have in common. But really, Emma isn't like me. She's like her. Or, with better grammar, she's like herself. I wasn't anything like Emma in fourth grade. I cared a lot about what others thought of me, and always wanted to blend in. She has a quiet confidence and dares to be different. I had just one or two good friends. She has a lot of friends and makes new ones easily. I was a "goodie two-shoes" and followed all the rules. Emma is more like a "goodie one-shoe", and will try to get away with things occasionally. I was never into non-fiction books. She devours books on history and hopes to be an Egyptologist or archeologist when she grows up. I loved sports, and although I lacked a natural athleticism, I always tried my best and was intensely competitive. Emma plays sports for the social interactions and rarely knows the score. We do have things in common, but Emma has never been, and hopefully never will be, just like me. I like her better as HER. There's a second class for both these events that's coming next. It's an acrylic mini-album with a nifty interactive feature. It's more . . . "conceptual" . . . at this stage, but I know it's going to work. I just know it!!! And UPS just dropped off some fabulous Rusty Pickle products to use - awesome! It's Mother's Day tomorrow, meaning I need to get a new post up! (I'm nothing if not consistent, no?) I wanted to give sneak peeks of the classes for Scrap-a-Ganza in June. The first SAG is in the Netherlands and the second is in England. All the cool kids are going . . . are you? The first class, which is a single-session class, is called Architecture. Last year I created a single-page project with the arches for the Flip, Spin and Play book and ever since then I've had somewhere near a million requests (give or take a few) to make it into a class. So I did! 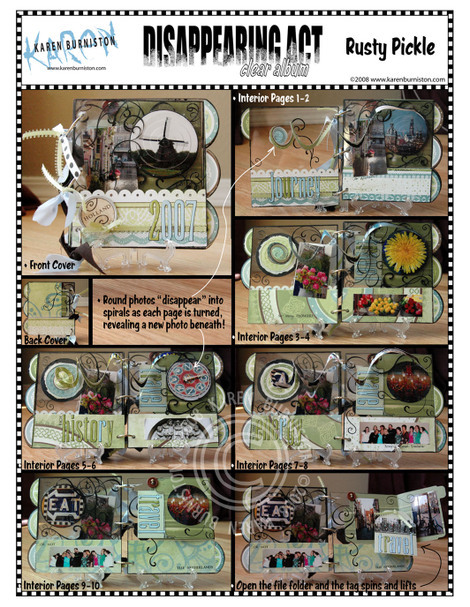 I expanded the project into a 2-page spread, and because we need so very many kits for both events, I was asked to use different papers for each event. I *believe* that the green version will be used in The Netherlands and the pink one in England, but I'm not totally certain. In any case, because the kits will include TWO entire alphabet sets, you can choose your title and don't have to feel like the green one has to be used for travel or the pink one for friendship, 'kay? All of the papers are from Basic Grey's Two Scoops collection along with some Making Memories brads, flowers and chipboard alphabets, plus some Chatterbox ribbon. It's a lovely kit in either color scheme, I do declare! Students should bring at least the arch pictures to class, although they can be added later, if necessary. Photo sizes can vary, except for the arch photos. The other class, which is a double-session, is called Wall Toy, and I know everyone's been very curious about it! 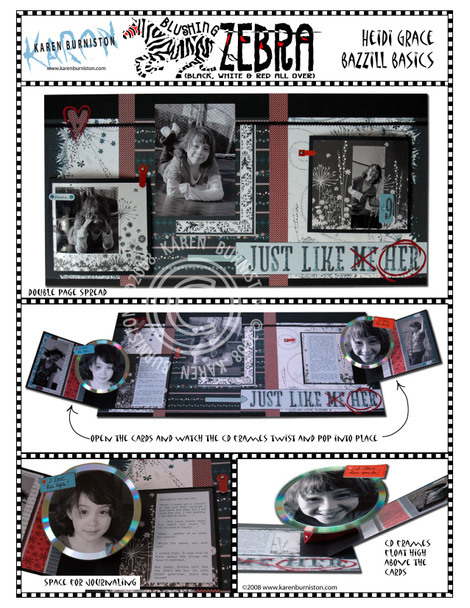 What happened was Heidi (the distributor and owner of the events) was able to purchase some Making Memories magnetic organization system panels at a discount and thought it would be fun to have me design a class project using them. Each student will receive TWO of the panels, which are worth $20 EACH! 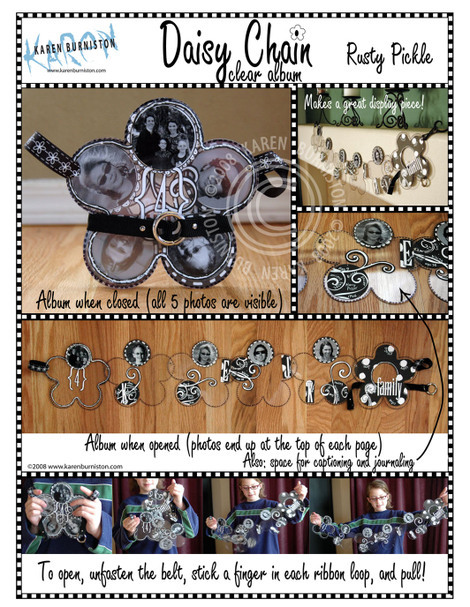 You'll also get a bulldog clip, two smaller clips and a round organization tin in addition to all the paper, cardstock, wire, magnets and stickers. This kit is overwhelmingly awesome! So I was challenged with making something cool using these wall panels as a base. And of course I wanted to make something interactive, so I created a "Wall Toy", which is a double-page layout, clipped to the panels, with interactive features that can be "played with" on the wall, should you choose to hang them. The collection is October Afternoon's Detours collection. But then, as you're walking by, you might choose to open the paper slinky on page one, or pull the ribbons on page 2 to make the flower pot jump out at you! Everything's magnetic, so the tin and lid on page one will stick wherever you want to put it, and the flaps on page 2 will stick to the edges of the wall panel. And here's how page 2 would look if you had it on the wall. The photo on top of the flower pot will just spring out at you and the flaps will stick to the panel in the "open" position. The two empty flaps are meant to hold journaling, but I haven't done that yet. 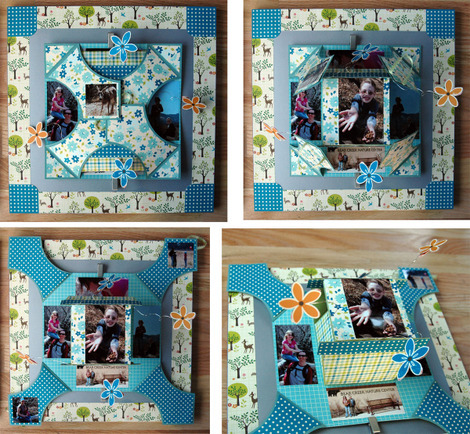 The middle portions of the layouts are 9x9 pieces that are clipped onto the panel using the magnetic clips. You can easily remove them or change them out. Now I realize that homes in Europe are generally more compact and that people really might not have a suitable place to hang a "Wall Toy" so you have the option of constructing the project as a two page spread for your album instead. You can keep the wall panels for organization or do something else exciting with them. You're not going to offend me if you'd rather make this as a layout. It will work fine, even inside a page protector. I even have a suggestion for incorporating a modified paper Slinky on page 1, which I'll go over in class for people who would rather make this as a layout. As with all my classes, they incorporate interactive features, techniques and templates. If you're not crazy about my color choices you can definitely make these projects again at home using whatever colors you prefer. All photos can be added later, photo sizes can vary, and none are required for class. Now I want to warn you that this class is ambitious, even for a double-session. I will probably have to assign the paper Slinky as homework because it takes a while to cut out all those rings. Rest assured that the technique is easy - just repetitive. You do not need to bring photos to class, but if you'd like to bring them to the event, perhaps to add during your cropping time, feel free. If you're doing the project as a layout, you may want to add photos to the front of the flower pot, too, since it will be viewed from the side. So that's what I've been working on. I've got two more classes in the works for private gigs in Europe, so stay tuned for those.